Alessandro Strumia, a physicist at the European nuclear physics agency CERN dared to state that the fact that there are very few Noble-prize winners among females is maybe due to a larger number of very high IQ people among males than among females. The current view among scientists is that the average IQ of males and females is about the same. However, there are different views about the IQ variability of males and females. Some research— here and here —indicates that IQ variability is higher for males than for females. 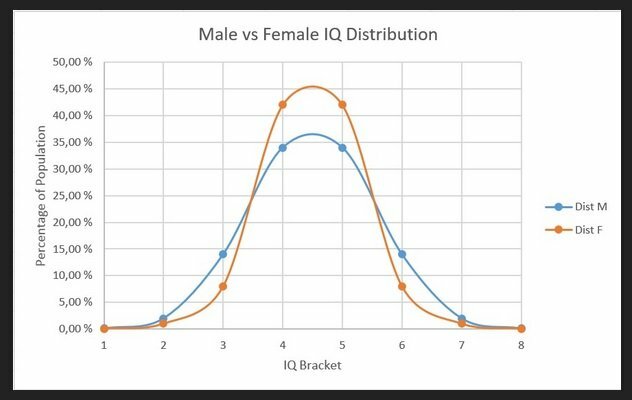 This means that the “bell-curve” of the IQ distribution for males is flatter than for females, resulting in both a higher number of very low IQ and very high IQ males than females. Male versus female IQ distribution: higher male variability hypothesis. The hypothesis that such a higher variability of IQ exists among males as compared to females is disputed by some other scientists. But all these data—and the arguments by Strumia—didn’t matter for the mob of physicists who attacked him. Video on the YouTube channel of StudioBrule.